Here, we are going to explain certain events that produce larger-than-average perch for inland lakes. 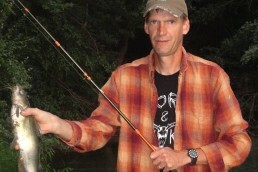 Years and years ago, I learned that a small weight too far in front of a lure or bait attracted too many panfish to strike at the weight before striking the actual lure or bait. So, moving the weight closer to the bait helped minimize these false strikes. Tying your line directly to the nose of the lure—eliminating the snap ring—helps the wobble of the bait at ultra-slow trolling speeds, which is needed during this type of approach. Trolling at .5 to .8 mph is the best speed. This is extremely important—slow is best. Some schools of perch are not suspended but are actually located directly on the bottom of a lake, and the water temperature is a critical factor regarding this approach. But can we catch perch while trolling before they spawn? Yes, but we also do very well with this slower method after the spawn. As the perch’s metabolism increases—with growing water temperatures after spawn—they will chase faster-moving presentations. 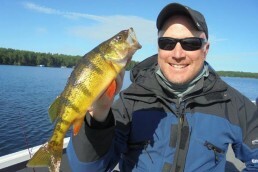 Perch are very aggressive fish and will feed on a year-round basis with very little interruption. If you find them, they’ll bite while vertical jigging, even in winter. Well, you hear this because for 90 percent of the time this is true as long as winter oxygen levels are not too low in the water. 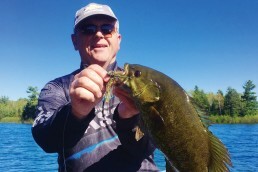 During open water, using a small nightcrawler harness works very well; so too does a piece of a ‘crawler with a hook and split shot with a bobber, a smaller jig with a crappie minnow, a leech with a slip bobber or trolling a small crankbait. Trolling crankbaits is popular for crappies, perch and big bluegills. We’re not burning all the gas out of our tanks trolling around and around the lake, but using a trolling motor is mandatory to obtain the slower speeds needed to produce these larger-than-average panfish and not spook them. Years ago, during the early ‘80s while I was fishing down in Alabama for jumbo crappies, I watched an old-timer who was guiding for this species and was trolling down the middle of a mile-long bay located on one of the many reservoirs. The entire bay was only about 18 feet deep and he and his clients were catching crappies one after another. Later that evening I met up with that old-timer guide and was explaining to him about all the perch we have in the North. He suggested trolling for them. Well, we could not troll in my location during those years so he suggested drift-trolling—that was the impetus for our success for bigger perch and the many methods that developed out of that meeting. Now that motor trolling is legal, we do not catch as many perch while trolling but we do catch bigger fish while doing so. The color of our jig and crankbaits, the trolling weights, the shape of our crankbaits, the speed we’re moving at and the depths we are presenting our bait in all make a difference in the level of productivity, but you must also experiment. Remember, selective harvest is very important, and releasing most of our catch is normal for my guests. 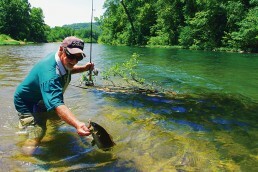 We do not keep all fish caught, but now is the time to go get ‘em.